As far as I know, there is nothing stopping that section of the Maybrook Line from being turned into a rail-trail, although I don't know of anybody planning to do so. The difficulty of connecting it to the Pok bridge is that the railbed has been built upon by a trailer park, and (maybe) a power company storage yard. And it runs through a couple of houses' front yards. Officially, where was the west end of the LV mainline? Was it TIfft St Yard? On a 1921 topo, I'm seeing a branch of some sort come of of the West Shore RR at Ravena. It finally tells me that those two stone trestle abutments that bracket the conveyor under the Thruway were indeed railroad related. Now the question remains: What railroad was it? EDIT: Just did some research and found my answer. I had NO idea of the amount of relocation that the West Shore went through.....pretty good amount. What was the purpose of the yard at Ravena? While traveling on I-90 to Albany yesterday I noticed that the West Shore bridge near Ft. Plain was being removed. There is a trail on the old ROW in this area so it was a surprise to see the bridge being removed. Does anyone know if it will be replaced with a smaller pedestrian/bicycle bridge? Was the bridge in bad shape? I, along with 538 of my closest friends, bicycled from Buffalo to Albany a week ago on the Erie Canalway trail. At Fort Plain, we had to detour off the trail because of flood damage. I had seen a gaping hole from the Thruway on the east side of the bridge, so I got a photograph of it. 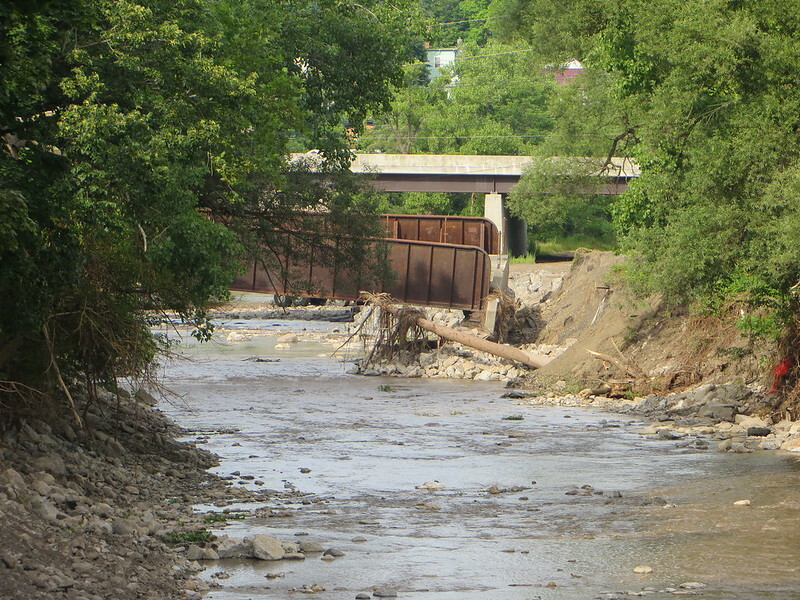 Sadly, the West Shore bridge had the eastern abutment undercut by the creek, and fell to the south. This is what it looked like looking north along the creek. 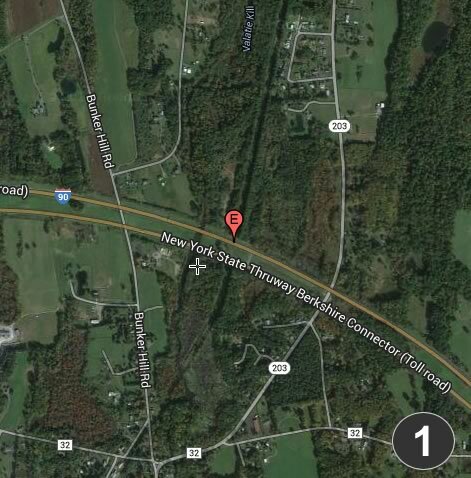 I am curious about a couple of old ROWs that cross the Berkshire Spur of the NY Thruway. Does any know when they were abandoned, etc. and are there any links to recommend sites re their history, etc.? 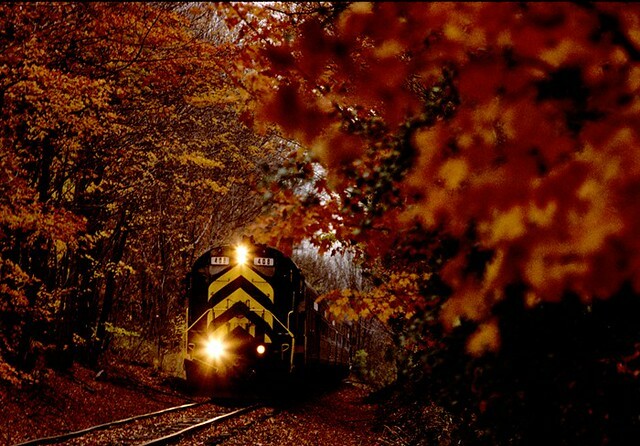 There are two more that you will cross if you head toward Massachusetts: the former New Haven branch that went from State Line down through West Stockbridge to Housatonic, and part of the original Boston & Albany line from Canaan to Chatham (visible only when the trees are denuded of leaves). I'm not sure of the date when the B&A was rerouted, but it was well before the turn of the century. I've never found a map that depicts the original roadbed in its entirety. It is largely above the level of I-90, on hillsides and, at one point, on a hill within the median. You really have to keep an eye peeled for it, because it's not terribly obvious. I believe you're correct, yes. This closely approximates the route of the ROW I've seen, and can be found on some of the more recent USGS maps. Now, where'd it go west of CR 5? We'll have to work on that question. Flatbrook.) That's the original ROW. It crosses I-90 at a very sharp angle, traversing the north side of Mercer Mountain. 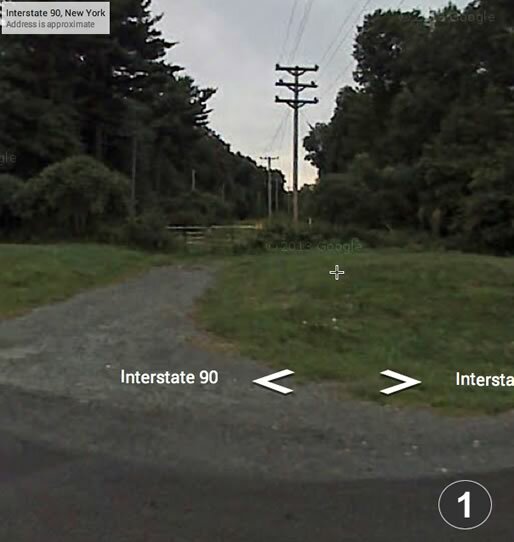 As it approaches County Road it disappears from the map. I'm wondering whether the eastbound lane of I-90 was laid over the roadbed from there to the vicinity of the tollbooth. 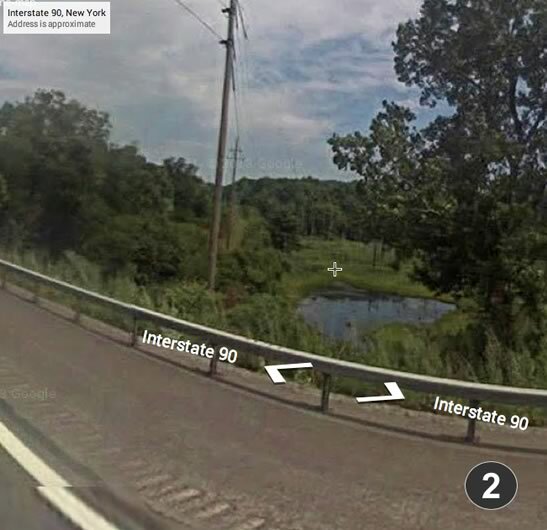 South of the tollbooth, there is a road that veers off toward the southwest at a suspiciously gentle angle and heads to the village of New Concord, where it continues suspiciously straight toward a tangent with the B&A, eventually becoming NY Route 295. One wonders. I've been to that area, but I don't know it well. I looked at old maps and it's clear that I'm wrong about the road to New Concord --- it doesn't lie on the old roadbed. 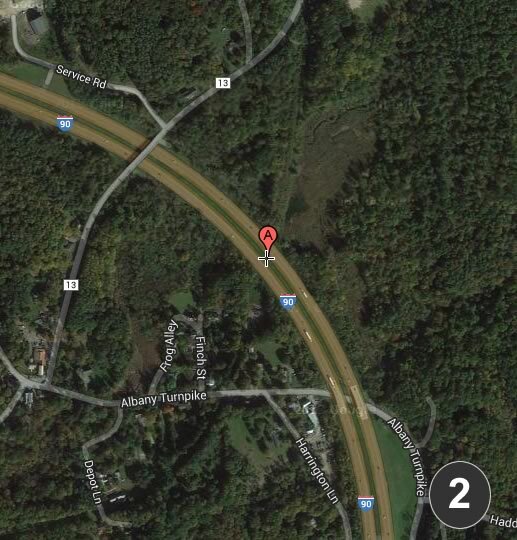 My guess is that I am correct, however, about part of the Thruway spur lying atop it. The question is where the west end joined the present line.